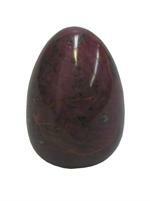 Item #EC-159: 2 3/8" tall Ruby In Matrix Egg. 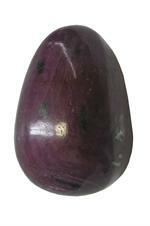 Item #GSE-109: 20mm tall, dark Purple/Red Ruby Egg with some slight inclusions. 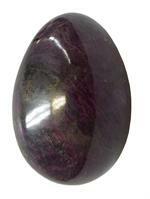 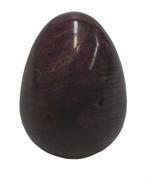 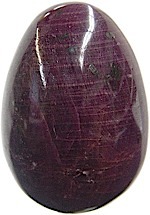 Item #GSE-107: 39mm tall, dark Purple/Red Ruby Egg with some slight inclusions. 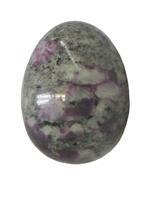 Item #GSE-539: 44mm tall Ruby Egg; 434.05 cts. 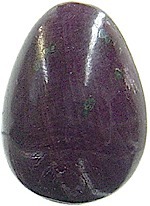 Item #GSE-540: 44mm tall Ruby Egg; 474.45 cts. 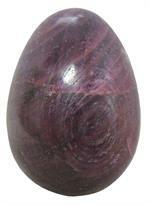 Item #GSE-541: 44mm tall Ruby Egg; 436.15 cts. 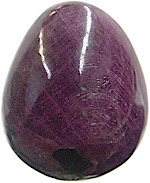 Item #GSE-542: 44mm tall Ruby Egg; 474.35 cts. 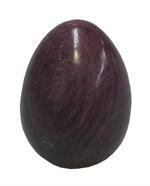 Item #GSE-538: 5" tall Ruby Egg; 11,235.00 grams. 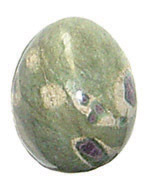 Item #GSE-272: 50-59mm Ruby In Fuchsite Egg; Medium dark to dark Purple/Red Ruby Crystals in Green Fuchsite.